Our Digital image x-ray system uses a small fraction of radiation as compared to traditional x-ray radiographs. These images reveal the health and position of your teeth. 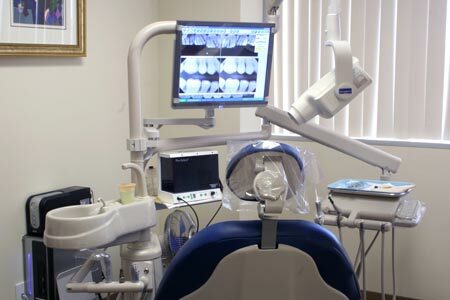 Any impacted or extra teeth can easily be seen on the monitor. Other abnormalities of the teeth, such as cysts, pre-cancerous, or cancerous growths may also be seen. Digital x-rays are able to reveal many dental defects that cannot be detected by the naked eye. Examples of such defects include decay under old fillings, cavities between the teeth, bone loss as a result of gum disease, bone damage, and changes in jaw bone structure. Changes in jaw bone structure are very important to detect because they can be caused by a systemic disease which affects the whole body and may be indicative of a greater medical condition. Because the image displayed on the computer screen is so much larger than film, patients get a clearer, more detailed view for a better understanding of their diagnosis.